A few years ago a fake supplement was marketed to autism parents for use on their children. The “supplement” was called “OSR #1”, OSR for “oxidative stress releif” or something to that effect. The name was a bit of a dodge, just as packaging it as a supplement rather than a drug was a dodge. It was/is a chelator. The chemical used–a novel synthetic chemical–was developed for use in environmental heavy metal polution. This is obvious but worth noting: one can not “supplement” one’s intake of a chemical that humans have never been exposed to before. If you remember OSR #1, you probably remember that the drug was pulled from the market. But you may be surprised to hear that it may be about to resurface. The claims listed above make clear that OSR#1 is intended to affect the structure or any function of the body of man or other animals. Accordingly, OSR#l is a drug under section 201(g)(1) of the Act, 21 U.S.C. § 321(g)(1). Disclaimers on your website, such as “OSR#l® is not a drug and no claim is made by CTI Science that OSR#1® can diagnose, treat or cure any illness or disease,” do not alter the fact that the above claims cause your product to be a drug. Moreover, this product is a new drug, as defined by section 201(p) of the Act, 21 U.S.C. § 321(p), because it is not generally recognized as safe and effective for use under the conditions prescribed, recommended, or suggested in its labeling. Under sections 301(d) and 505(a) of the Act, 21 U.S.C. §§ 331(d) and 355(a), a new drug may not be introduced or delivered for introduction into interstate commerce unless an FDA-approved application is in effect for it. Your sale of OSR#1 without an approved application violates these provisions of the Act. Mr. Haley’s company reportedly sold about $1.5M of OSR#1 as a supplement from his company CTI Science. I saw reports that OSR#1 was selling for about $2/pill so that’s maybe 750,000 pills. That’s a lot for somethiing untested for safety or efficacy. CTI appears to be a shortened version of the original name of the company: Chelator Technologies, Inc.. Chelators are drugs, not supplements. All this said, CTI Science doesn’t appear to exist any more. If you go to the old website, www.ctiscience.com, you get directed to a non operating website, http://ermesmedical.com/?reqp=1&reqr=. EmeraMed Limited is a biotechnology firm developing the antidote – heavy metal chelator and antioxidant – Irminix® (Emeramide). The Company is working to obtain marketing authorization in the EU and the US for the treatment of mercury toxicity. Phase 1 and Phase 2a clinical studies have been performed. They have offices in Ireland, Swedend and the US (Kentucky–home of Boyd Haley). But no mention on the website about who is involved with the company, which I find rather odd. They note that the drug is not yet approved, but that they may be able to supply it to people under an “early access program”. Yes, why wait for actual approval and confirmation of safety and efficacy. This would be for use as a chelator–no mention of work as an autism treatment. There never was a good reason to use this for autism. Boyd Haley was long a proponent that autism is a form of mercury poisoning. Put simply, Boyd Haley was wrong. Very clearly wrong. Mr. Haley and others may not be named on their website, but on SEC documents, he is named as part of Ermes Medical. If I read this document correctly, they have raised over $3.5M for the company. As noted in their literature, they have been involved with clinical trials. For mercury poisoning. In Ecuador. No small irony there: many of Mr. Haley’s supporters complain that “big pharma” performs their clinical trials (or experiments, as his supporters would characterize them) in developing countries. They are still pursuing patents for the treatment neurological disorders. No trial that I have found. Likewise for evidence of efficacy in humans. But a patent application. A similar patent for treatment of COPD. Should OSR#1 (under whatever new name) be approved for chelation, we can expect that it will return to the fake autism treatment world. Many still subscribe to the failed idea that autism is caused by mercury poisoning. That idea, pushed by Mr. Haley and others, was based largely on the idea that as mercury exposure from infant vaccines increased, so did the rate of identified autism. Biologically the idea was clearly wrong (autism and mercury poisoning are not similar). 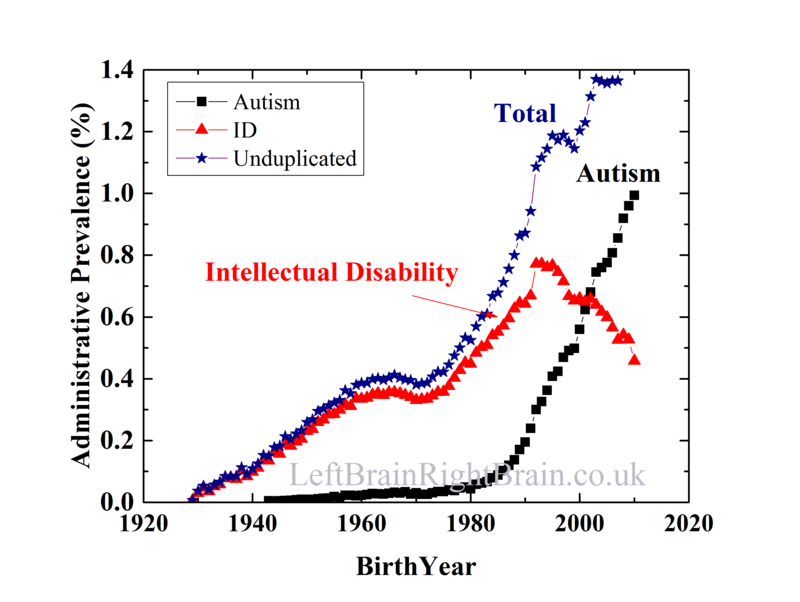 Also, even though mercury was removed from infant vaccines, autism rates have not fallen. All that clear logic said, there still are people who chelate as an “autism treatment” and a new product will almost certainly cause a spike in the numbers trying chelation. So, yeah, OSR#1 is gone. Except it may return soon under a new name. And likely a higher price tag. And it still won’t be a real treatment for autism. One of the purported treatments for autism is the Gluten-Free/Casein-Free (GFCF) diet. Studies have failed to find a benefit, but the idea persists. Especially among those who believe that autism is a vaccine injury (it isn’t) and that mercury in vaccines contributed to the rise in autism rates (it didn’t). The study is The Unintended Consequences of a Gluten-Free Diet. The full study doesn’t appear to be available. This looks like a conference abstract. 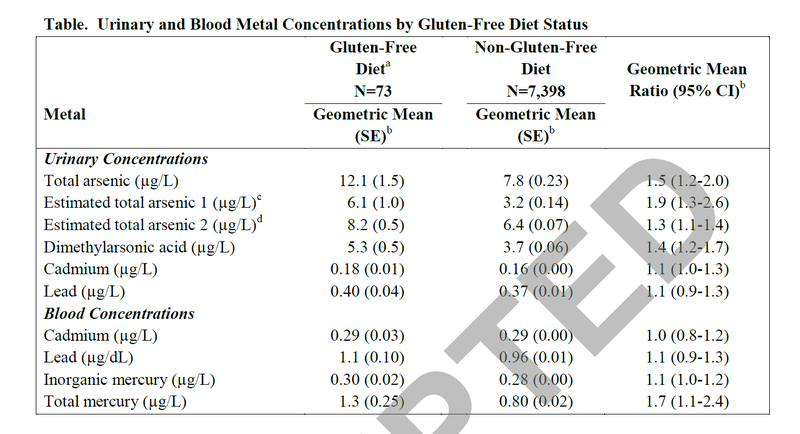 Total mercury in the blood is 1.7 times higher in people in the gluten-free diet group than in the overall population. Now, it looks like the units in the table are ng/l, so a total mercury level of 1.3ng/l (that in the gluten-free group) is still well within the normal range (<10ng/l). Of course it is also worth mentioning that those who promote the gluten-free diet for autistics often have the attitude that no mercury level is safe (which is tough, since there is mercury at some level in just about everything). So, yeah, ironic but not dangerous. By pushing the gluten-free diet, people may have pushed autistic kids into higher levels of mercury in their blood. Do we expect Robert Kennedy, SafeMinds, Mark Blaxill, JB Handley, Generation Rescue or any of the others in what was once called the “mercury militia” to inform their groups about this? Sure, if they are really about autism and not about attacking vaccines. Which is to say, I doubt it. IMFAR (the International Meeting For Autism Research) starts tomorrow. IMFAR is the world’s largest autism science conference. I don’t recall the exact statistics, but there are probably over 1000 researchers who attend. Literally hundreds of presentations on various topics. I am not attending, but I will try to write a few articles about abstracts and topics that I think of are interest. I do know that this year Shannon Rosa (twitter: @shannonrosa) and Carol Greenburg will be attending and tweeting and probably putting some thoughts up at the Thinking Person’s Guide to Autism (twitter: @thinkingautism, Facebook and the TPGA blog. IMFAR shows what a huge effort is going on in autism research. People are working hard to understand autism and (more importantly) make a difference in the lives of autistics.